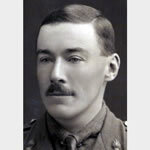 On 19 December 1914 at Neuve Chapelle, France, Lieutenant Neame, in the face of very heavy fire, engaged the Germans in a single-handed bombing attack, killing and wounding a number of them. He was able to check the enemy advance for three-quarters of an hour and to rescue all the wounded whom it was possible to move. Initiated in the post war period as a Lieutenant Colonel and whilst resident at Haversham.